I (Celine) recently started a volunteer job at the library for the summer. While I don’t earn anything for helping out there (obviously, because of the word volunteer), it has been rewarding anyway! The library is a great place to work on a hot summer day because it’s very well air-conditioned, peaceful, and the work itself is not too difficult. One of the pluses is that I can get books out regularly. We have been meaning to get the Bouchon Bakery Cookbook out for ages, but someone or some people have beat us to it for the past few months and renewed it over and over. (We wanted to get it out of the library first to decide if we ever want to buy it; it’s an expensive book!) I finally saw it last week and you can bet I checked it out immediately. We have tried several recipes from it so far, and they all have been great successes. Ok, I know that when bloggers label something as “the best” it can be an inadvertent lie, because everyone has different taste buds and bloggers themselves vary so much in terms of the quality of the recipes that they share. But this is a recipe that I can absolutely, 100% guarantee you will love. 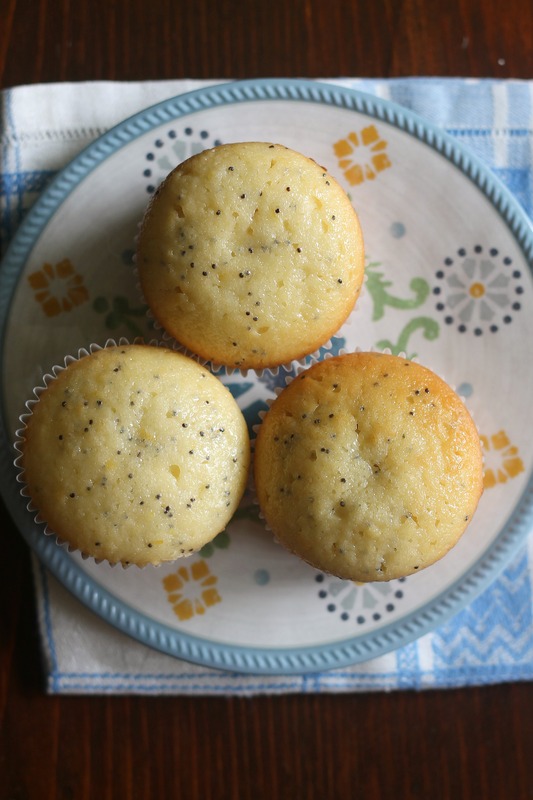 I know we already have a recipe for lemon poppy seed muffins on our blog, but I have to say that these are definitely better. While the other recipe is handy if you don’t have a lot of time (these muffins require an overnight rest) and is certainly delicious, these muffins are worth the effort and time to make. 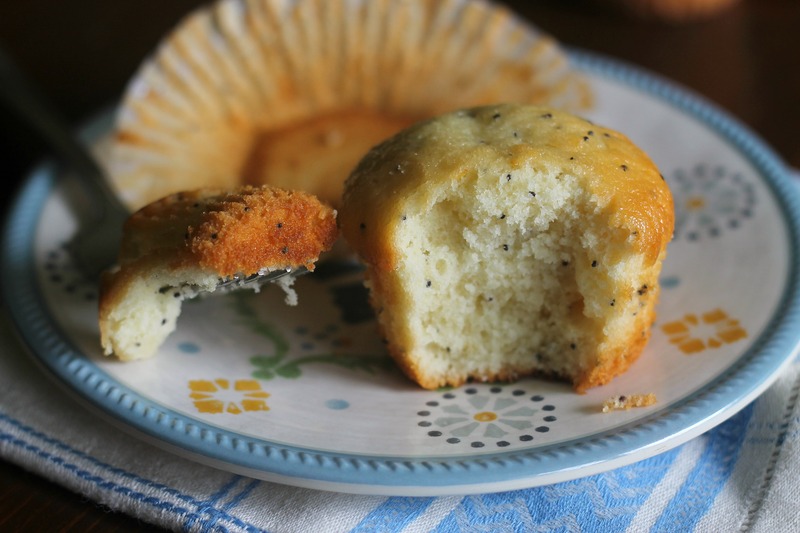 Thanks to cake flour, the muffins are very tender. However, they don’t fall apart and crumble the way cake does, making them a nice and substantial breakfast treat. Because of the overnight rest, they are not dry at all. The lemon flavor is also ideal, and the muffins have just a slight tang to them; however, they are still sweet enough to not need a glaze. In other words, they are perfect! Sift together the cake flour and baking powder into a medium bowl. Whisk in the salt. In a deep medium bowl, combine the sugar, eggs, and vanilla paste using an immersion blender (alternately, you could probably use a regular blender, although we have not tried that). Add the dry ingredients in 2 separate additions, blending until just combined. While the blender is running, pour in the butter in a steady, moderate stream and mix until the batter is smooth. Add the lemon juice and blend it in. The batter will be somewhat thin. Fold in the lemon zest and poppy seeds. Put the batter in a covered container and refrigerate overnight (about 8 hours) or up to 36 hours. When ready to bake the muffins, heat the oven to 425 degrees. Line the muffin pan with papers and spray them with nonstick spray. Divide the batter evenly between the papers (about 135 grams in each well for jumbo muffins, or 67 grams for regular muffins). Place the pan in the even and lower the oven temperature to 325 degrees. Bake the jumbo muffins for 34-37 minutes, or the regular muffins for 25-28 minutes, or until the muffins are golden brown and a skewer inserted in the center comes out clean. Set the pan on a cooling rack and let the muffins cool completely. They are best served the day they are baked, but you can wrap the muffins well and freeze them for up to a week (or at room temperature in an airtight container for 3 days). Enjoy! Note: To thaw the muffins from freezing, defrost them in their container or warm individual muffins in the microwave on a plate for 20-25 seconds. Both methods work well for us.